Liverpool are one of the clubs who could pounce on Isco’s unhappiness at Real Madrid, reports Spanish outlet Ok Diario. 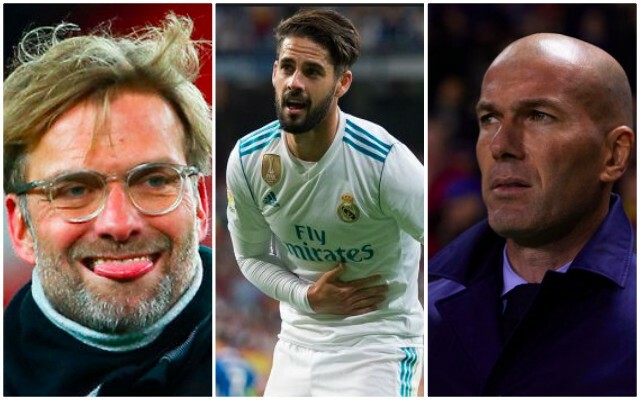 We’ve already been linked with Nabil Fekir and Ousmane Dembele this summer, before the season is even over, but Isco’s the biggest name of the three by some distance. The Spaniard is not an automatic pick for Zinedine Zidane, only making 21 starts in La Liga during the course of 2017/18. The source claims that even if Zidane picks Isco for the Champions League Final, he’ll demand an exit come June. They reckon Isco is tired of being a rotation option and that he’s decided he needs a ‘change of scenery’, but namedrop Manchester City, Arsenal and Bayern Munich as potential suitors as well. Isco would obviously be a jaw-dropping signing and we can’t really understand how Zidane picks players like Lucas Vasquez ahead of him. But whether Los Blancos will let him go is another matter, especially if Liverpool beat them in Saturday’s Champions League Final. Under Jurgen Klopp, the playmaker could be used either as a no.10 in a 4-2-3-1, or a no.8 in a 4-3-3, much like Coutinho was before his January exit to Barcelona. If we land Fekir, a definite target [Echo] though, we can’t imagine Isco will also be on the radar. But if the Frenchman is unattainable, he’ll be a mighty interesting option.